Next up from ArtsEmerson: The World on Stage is the American Premiere of Oxford Playhouse’s "One Small Step," a fast-paced comic work recounting the history of humankind’s quest to explore the final frontier. Deftly exploiting our fascination with the space race, this show will appeal to the whole family, especially anyone who ever spent childhood mornings building an exotic world out of blankets, and empty cardboard boxes in the living room. Performances, running approximately 90 minutes, will take place Oct. 20 - 24 the Paramount Black Box Theatre, located at 559 Washington Street in Boston’s Theatre District. Seating is general admission, and performances are suitable for the entire family. 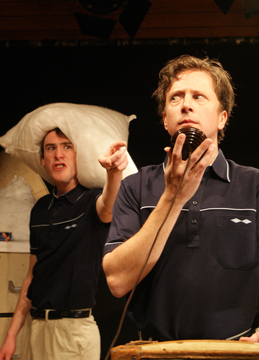 "One Small Step," written by David Hastings and directed by Toby Hulse, launched to rave reviews at the 2008 Edinburgh Fringe on the 40th anniversary of the moon landing. Two extraordinary young actors - Robin Hemmings and Oliver Millingham (at left) -- use little more than cardboard boxes, buckets and a thermos to recount the history of moon travel, taking the audience on an action-packed trip involving no less than 41 characters. This is an inventive exploration of a story that appeals to just about anyone who lived through the first moon landing as well as anyone who still finds the idea of space travel awe-inspiring. The result is a history of the space race, frenetically paced, with pillows as clouds beach balls as planets and everyday household items as rockets. Audiences should keep their eyes open for quick cameos from Cronkite, Kennedy, Nixon, Gagarin, Armstrong, Aldrin and others as the action travels from Houston to Moscow and into the cosmos. From the first dog to be rocketed into space, to the moon landing and beyond, "One Small Step "is full of emotion, epic achievements and humor. Oxford Playhouse presents and produces a wide range of performances. The program includes the best of British and international drama, family shows, contemporary dance and music, comedy, lectures and poetry. The Playhouse tours its own shows, hosts artists-in-residence and presents Playhouse Plays Out, an ongoing series of off-site events which happen at locations across the county. For tickets and information, stop by the box office, call 617-824-8000 or visit www.artsemerson.org.